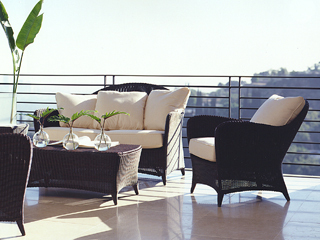 Classically designed and with a well-formed language, the RIVIERA line is a collection of leisure furniture for indoors and outdoors, including an armed dining chair, a lounge chair and ottoman, an adjustable chaise lounge and a love seat/sofa. The furniture is made of powder-coated aluminum frames upholstered with a hand woven resin. The units come in two colors, mahogany and blonde.